During the recent federal government shutdown, help came to us all in all directions, and we can’t express our gratitude for the outpouring of support we received. It was a time of uncertainty for thousands of federal workers in Utah, and we helped our partner agencies meet the increased need by ensuring a consistent and increased supply for those areas most affected. We are proud that we have enough product to be able to meet such a sudden increase in need, and especially proud at just how nimble and creative we can be, especially for an organization of our size. 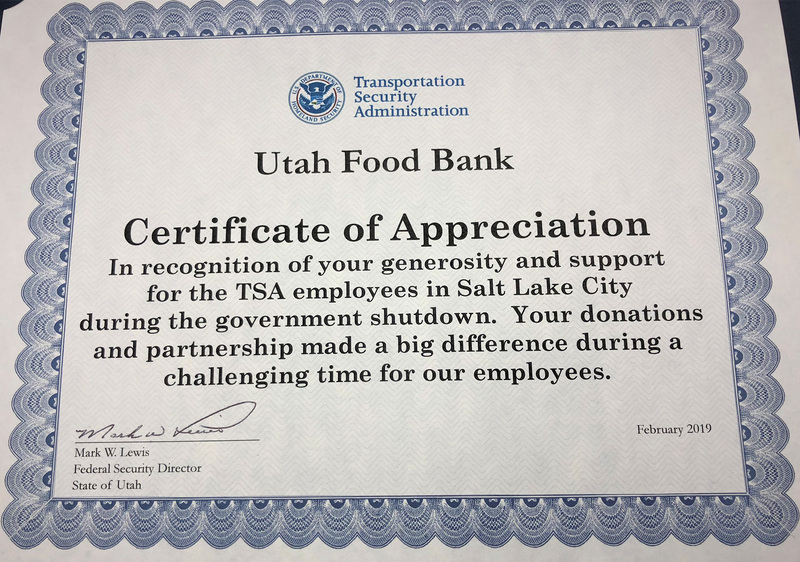 A few weeks in to the shutdown, we received a call from a man whose first concern was for his staff, who just happened to be the TSA workers at the Salt Lake airport. He wanted to know if there was anything he (or we) could do to help them through this tough situation, which was new to so many. What these, and many other federal workers, were experiencing is what is referred to as “episodic poverty.” Hard-working Americans who may have never before experienced such a major and abrupt financial shortfall suddenly found themselves unable to make ends meet. While we are so glad this is behind us, please keep in mind that there are still millions of American families who are just one unexpected medical bill or car repair (or missed paycheck) away from needing help. According to a recent report from the Federal Reserve Board, if faced with an unexpected $400 expense, 40% of American adults would need to either borrow money, sell something or not be able to make that payment. It often surprises people when they learn that most of the families we serve are working families, many working more than one job. This experience shined a light on what episodic poverty is, and just how easily it can occur…to anyone (even your neighbor), and just how appreciated your support is!